KDZ 플래싱 유틸리티는 LG전자의 펌웨어 파일을 사용자의 모바일 디바이스에 설치하는 프로그램입니다. 이 프로그램을 사용하면 디바이스가 비정상적으로 동작할 때 응급 복구를 할 수 있습니다. 또한 GomdoLight를 설치하지 않았거나, 디바이스를 루팅하지 않은 사용자의 경우에도 가끔씩 비정상적으로 (운이 나쁜 경우) 문제가 발생할 수 있는데, 이런 경우에도 이 프로그램은 효과적인 구제 수단이 됩니다. LG Flash Tool 2014 is a software program that installs the ‘KDZ’ files (LGE’s firmware file format) to your mobile device. You can use it to recover your device when it is not functioning properly. This program also can help stock users (without GomdoLight or root) experiencing unexpected problems. KDZ 플래싱 유틸리티는 여러 가지가 있지만 가장 성공 확률이 높은 것은 LG Flash Tool 2014입니다. 아직 다운로드하지 않았다면, 지금 다음의 위치 중 하나에서 다운로드하십시오. 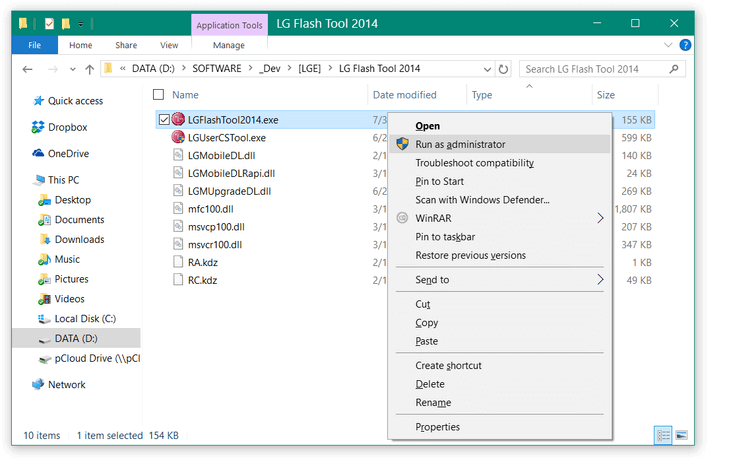 Download LG Flash Tool 2014 from one of the links below. 먼저, 다운로드한 KDZ 플래싱 유틸리티의 압축을 해제합니다. 압축을 해제하는 대상 경로에는 공백이나 특수문자, 영문자 이외의 다른 문자가 포함되지 않도록 하십시오. 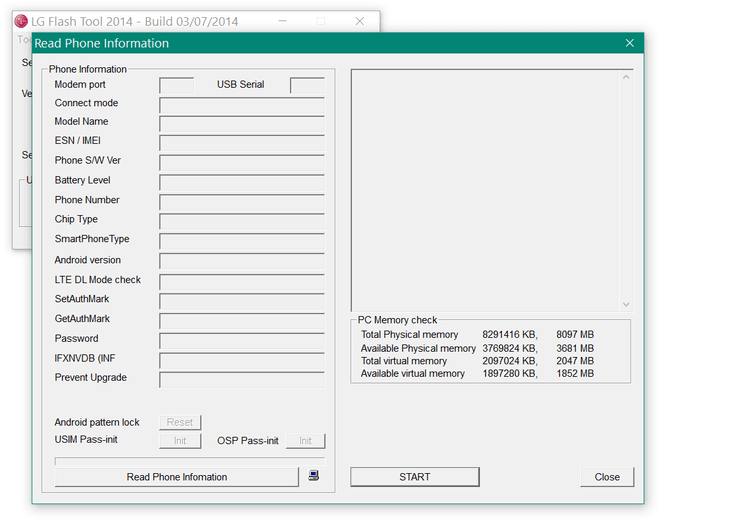 First, extract LG Flash Tool 2014 from the archive file you downloaded. It is strongly recommended that the path you’re extracting the files to does NOT contain any non-ASCII characters (e.g. special characters) or blanks. If your PC does not have the LG Mobile driver software installed, download and install it now. Without it, LG Flash Tool 2014 will not function properly. 만일 현재 PC에 사용자의 디바이스와 관련하여 LG전자의 소프트웨어 제품이 설치되어 있다면, 충돌의 가능성을 줄이기 위해 모두 제거하십시오. 단 LG 모바일 드라이버는 제거하지 않습니다. 이것으로 준비는 모두 끝났습니다. If you have any software products related to your mobile device, UNINSTALL them to prevent conflict issues. However, do not uninstall the driver. Now you are all set. (1) 먼저, LGFlashTool2014.exe 파일을 관리자 권한으로 실행합니다. First right-click on LGFlashTool2014.exe, and run it as administrator. (2) 그 다음에, ‘파일 열기’ 버튼을 누르고, 원하는 KDZ 파일을 선택하여 엽니다. 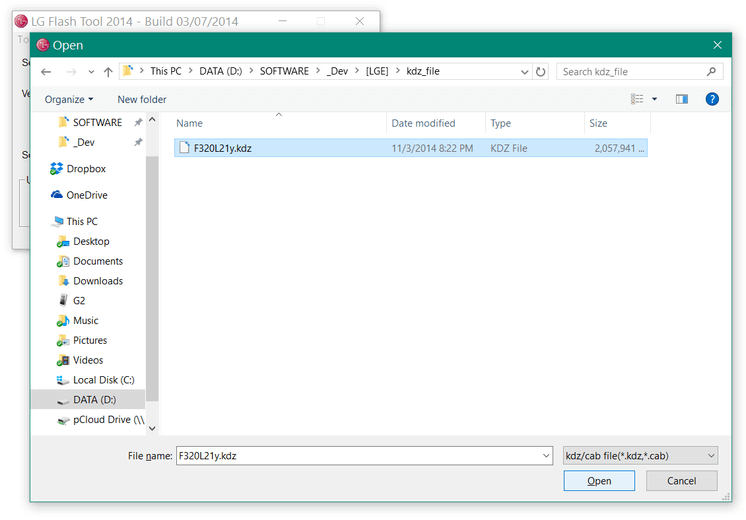 Then, click on the ‘file open’ button, and select the KDZ file you wish to install. (3) 상황에 따라, ‘Normal Flash’ 또는 ‘CSE Flash’ 버튼을 누릅니다. Now, press the ‘Normal Flash’ or ‘CSE Flash’ button. CSE Flash를 사용하여야 하는 경우는 다음과 같습니다. Normal Flash를 사용하여야 하는 경우는 다음과 같습니다. 경고: CSE Flash 시 디바이스는 반드시 강제로 공장초기화 됩니다. 반드시 사용자의 데이터를 먼저 백업하십시오. CSE Flash WILL AUTOMATICALLY FACTORY RESET YOUR DEVICE. Back up your apps, settings, data, and files before proceeding. (4) 그러면, 아래와 같이 디바이스의 상태를 읽어들이는 창이 나오는데, 무시하고 ‘START’ 버튼을 누릅니다. LG Flash Tool 2014 will try to read the device’s status, but this is not important. Ignore it, and just press ‘START’. (5) OK를 눌러 KDZ의 설치를 시작합니다. Press OK to start flashing the KDZ. (6) ‘LG Mobile Support Tool’이 자동으로 실행되어 설치를 진행합니다. 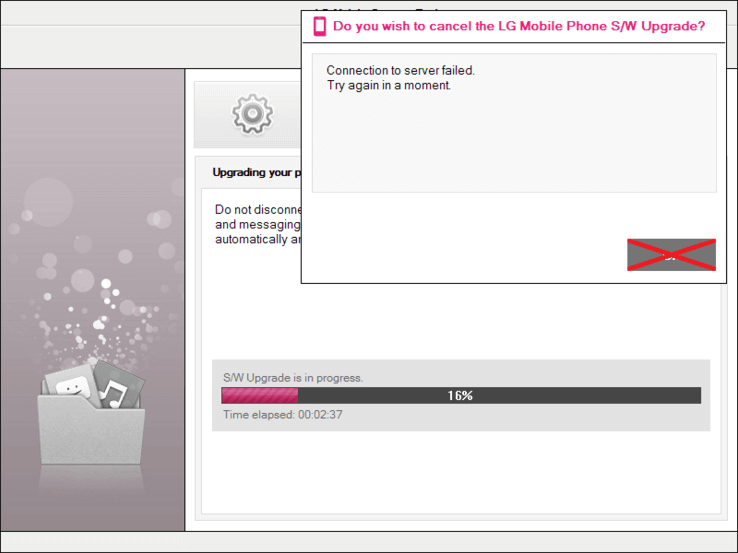 Now ‘LG Mobile Support Tool’ will take the control over, and start flashing. (7) 그런데, 중간에 ‘서버와의 연결이 실패하였다’는 취지의 메시지가 표시될 수 있습니다. 이 메시지가 표시되면, 어떠한 버튼도 누르지 말고 그대로 무시합니다. 무시해도 백그라운드에서 KDZ의 설치가 계속됩니다. However, you may see the dialog stating that the connection to the server is lost. DO NOT PRESS ANYTHING. DO NOT EVEN TRY TO DISMISS THE DIALOG BOX, JUST IGNORE IT. It will just continue flashing in the background. (8) KDZ 설치가 끝나면 LG Mobile Support Tool이 비정상적으로 종료될 수 있습니다. KDZ의 설치가 이미 끝났으므로 프로그램을 종료해도 됩니다. 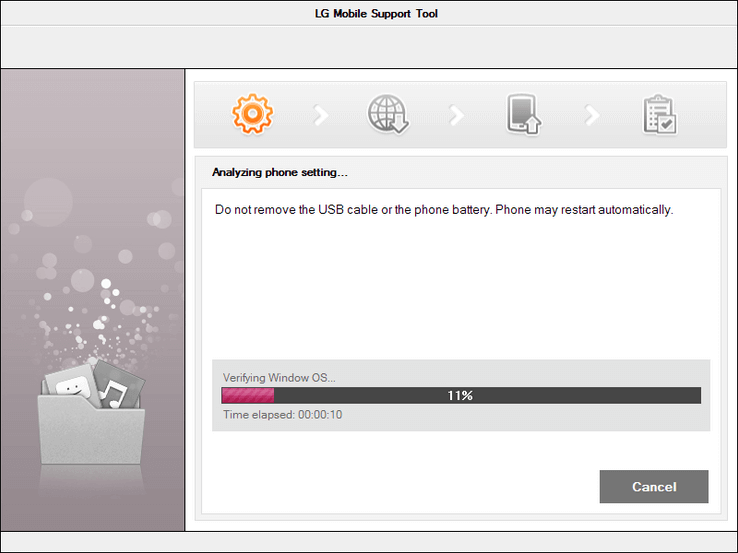 Upon finishing, the ‘LG Mobile Support Tool’ might crash. You do not need to worry, as it’s finished already. (9) 이것으로 모든 과정이 끝났습니다. KDZ 플래싱 유틸리티를 닫습니다. This concludes all. You now have flashed the KDZ. You can safely close LG Flash Tool 2014.